Friends since college, Alex and Laura entered real estate with a shared commitment to advocating for their clients and providing them with the information they need to make informed, responsible, and rewarding decisions about homeownership. They help sellers translate the emotional connection they have to a home into powerful marketing, guide them through the pricing process, help prepare properties for the best possible sale, and provide guidance in choosing the right buyer. And they are committed to helping buyers find the perfect home, serving as trusted advisors about neighborhoods, market conditions, and strategies for making an offer. Alex and Laura understand that buying or selling a house represents so much more than bricks and mortar. They are driven and inspired by the unique way that real estate shapes the way we live, work, and build community. 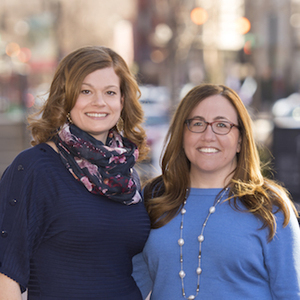 Alex and Laura came to real estate from a background of social services and nonprofit management. After sharing a job at a community-based nonprofit helping homeowners facing foreclosure, they decided to translate their social service skills to real estate. They pride themselves on their expertise in community based housing resources. Laura is proud to live in the rapidly changing NE DC neighborhood of Woodridge. When she’s not focused on real estate, she’s raising two amazing and energetic boys, seeking out new food experiences (especially those close to home), reading thought provoking books, and going out dancing every chance she gets. Alex has lived in many DC neighborhoods over the years including Dupont Circle, Shaw, Columbia Heights, and Capitol Hill. Currently, she loves living in LeDroit Park, a peaceful oasis with a great neighborhood vibe in the middle of a bustling city. When she’s not focused on real estate, Alex enjoys exploring the city's many green spaces with her dog Chelsea and supports DC’s thriving local theater scene.